Interactive interval timer. Users can create and play through custom timer routines. React Timer is built with React, Redux and Ruby on Rails. Carb Tracker allows users to track their daily nutrition (carbohydrates, protein, and fat) as a way to reach health goals. Nutrition data is provided by the NutritionIx API. Carb Tracker is built with the Ruby on Rails web development framework. Photo Vistas uses the Unsplash API to provide your favorite Unsplash photos in new browser tabs. Photo Vistas allows the user to create their own custom photo queue and associated homepage bookmark. Photos are rotated daily at midnight. Photo Vistas is built with Ruby and the Sinatra web development framework. RetroCasts provides a command-line interface for access to metdata from RailsCasts.com. Features include episode lists, episode details, and search. Personal website created with the Middleman static website generator. QuestionFair.com is a website for asking questions and getting answers. The website includes a few more advanced features including location tagging, points rewards and friendships with other users. The web app was created as a final academic project for completion of a Master's degree in Information Systems. 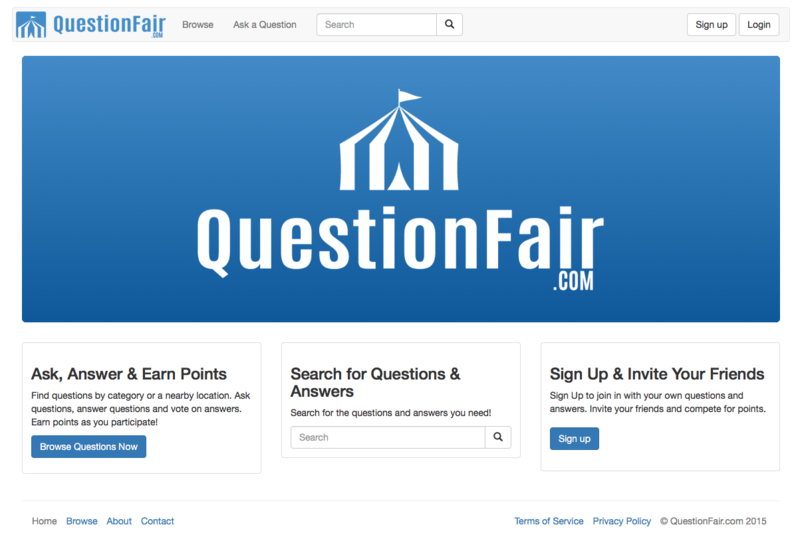 QuestionFair was built using the Ruby on Rails website framework.